A twist on classic coleslaw, made with celeriac rather than cabbage for a delicate nutty flavour. Dressed with a creamy mayonnaise and vinegar dressing. This dish makes a great alternative to coleslaw – particularly for those who find brassicas difficult to digest and struggle with the traditional white cabbage component. It has a nutty, creamier taste, that pairs particularly well with ham and duck and summer picnics. It can be made in advance and will keep well for up to five days in the refrigerator. 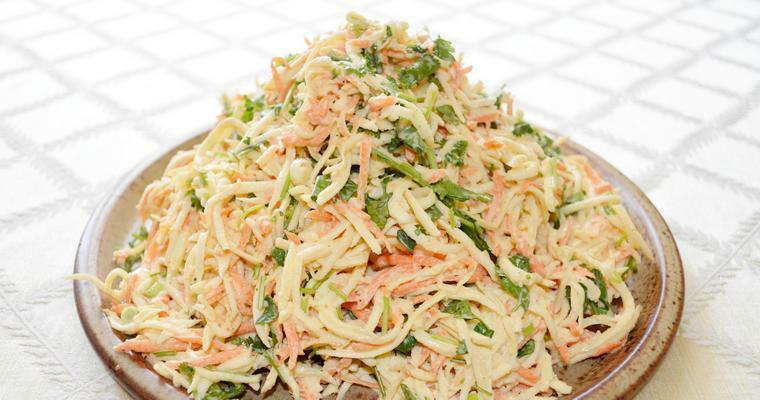 Use a food processor to julienne the celeriac and carrot. If you do not have a food processor, thinly slice the vegetables then chop into matchsticks. Toss immediately in the lemon juice to stop the celeriac from discolouring. In a large salad bowl, combine the mayonnaise, Dijon mustard, honey, salt and pepper. Mix until fully blended. Add the celeriac, carrot, spring onions and coriander. Toss well to coat evenly in the mayonnaise mix.